For those in the table top gaming hobby, there is a high percentage chance Gen Con has some meaning. It is a four day gaming convention held in Indianapolis which, at last count, hosted over 45,000 people. I was looking forward to Gen Con 2015 up until just a few days ago. Gen Con gives me a chance to play games that I do not get play at home. It also is a place where I get to see friends from all over the country and game and hang out for a few days. On top of all this, I also go to seminars and hear what the different companies will be producing in the coming year and write about it. Gen con is a manic high where fun and frolic are the name of the day and the post-con drop is terrible as you miss all the old friends you were able to see and the new friends that you have made. The problem is that I was looking forward to Gen Con. Now, I’m conflicted. Indiana has signed into law SB 101 which is, on the face of it, a law meant to protect religious freedom. The problem lies in the wording which differs from the federal law which was designed to allow those who had clothing or dietary needs of their religions to be given leeway for their practice. Indiana’s law is written in a way to allow businesses and individuals the ability to discriminate against others based on religious belief. In particular, businesses could refuse to serve those in the LGBT community because of the owner’s religious beliefs. This means that at Gen Con the hotel that I am staying at could choose not to let me stay or a restaurant could refuse me seating. This gives me pause and makes me consider what to do. Gen Con did not take the possibility of the signing of the bill into law silently. Gen Con sent a letter prior to the signing of the bill to Governor Pence which you can read here. The letter points out that the diversity of the crowd that attends Gen con is one of the convention’s main strengths and that this bill would put sections of Gen Con’s fan base at risk. I was heartened to see that Gen Con took some action in regards to this legislation. I just wondered what their next step would be since there appeared to be no changing course on the part of Indiana’s governor. As expected, Governor Pence signed SB 101 into law. Gen Con released another letter which you can read here. In the letter, Gen Con states that they have been communicating with the local businesses in Indianapolis which all stated that they are going to strive to ensure all attendees have a wonderful convention. The letter also points out the that city of Indianapolis was against the bill the entire time. Gen Con points out that planning is a long term affair and that this bill will have an impact on negotiations for where Gen Con will be come 2020. Gen Con acknowledges in the letter that this bill will make people choose not to come to the convention and that they understand this. The letter also puts forth that Gen Con would like to hear from attendees about any negative experiences they have at the convention this year. This is where my conflict arises. There were howls of outrage that Gen Con was not immediately pulling out of Indiana. There were calls to boycott Gen con for this reason alone. The thing for me is, I’m aware of what it takes to organize a convention of this size. There is no way to move that many people to another venue on such a short notice. In addition, Gen con is it’s own business now and could not afford the cost of the breach of contract lawsuit and fines at this point. It would most likely destroy the convention outright. In addition to all of these things, I know of people in the LGBT community that benefit from the presence of the convention in Indianapolis. These are people that work as servers, retail, hospitality, and other industries that are positively impacted by Gen Con. It feels like boycotting Gen Con would be adding insult to injury to these people. What’s a geek bear to do? I’ve mulled it over and looked and what others are saying about it online. The thing that has stuck with me has been the point that this will not withstand court action. I agree with the sentiment but feel the people that say this are dismissing those that are going to be that court case. One of the things that could come from me going to Gen Con is that I could be that person. I understand that this isn’t probable but possible. The law goes into effect on July 1st and there will be those pushing to move it into court quickly. The thing is, not going feels cowardly on my part. There are those in the LGBT community that live in Indiana and can not move. There are many reasons for this and all of them are acceptable. My boycotting Gen Con seems more of way of shielding myself from facing the discrimination that they may face on a daily basis now due to this law. I understand those that are boycotting both Indiana and Gen Con. There is no correct answer to this question. For me, I’m going to go to Gen Con and be out and proud the entire time. I will wear my gaymer tag on my badge as well as my shirt that says bearded, gay, and awesome. I will also pick up some shirts from Killer Bob, The Moody Bear, and Burly Shirts to wear at Gen Con. No time to be a shrinking violet. Time to be out and proud and willing to take the lumps with those that have no way of avoiding them. I will still be lucky enough to go home afterward. One of the things that I’ve missed discussing has been web comics. They have been around for quite some time now and the titans of the industry have their own conventions at this point. I’m sure you’ve hear of PAX, PAX East, and PAX South. If not, they are conventions about gaming, and other geeky things put on by the webcomic, Penny Arcade. I stumbled upon Buying Time about six months ago looking for web comics that had gay protagonists. As the subtitle implies, Buying time is a cyberpunk romance set in Hyperion city. The main character, Vinnie Smalls, works as a welder at Hyperion City Core where he discovers that he has a crush on a coworker. The reader is introduced to a world where, in stead of money, everything is measured in Daily Leisure Credit. How does a poor, lonely, guy meet someone when even having a chat costs DLC? Buying Time was created by Casey J an animator out of Canada. He is creating a story where we get to explore this futuristic world where human interaction is the ultimate commodity and the powers that be have finally found a way to control even this. His story telling style slowly brings us into the lives of Vinnie, his crush, Galvin, and their supporting cast. He does an excellent job with world building as well. As the story flows, this society is revealed to us in an unhurried and careful fashion. The cyberpunk vibe is there from the beginning but the reasons for the changes are left a mystery. These mysteries, much like the characters, are explained as we spend more time with Buying Time. I love Buying Time. First, there is the art which is gorgeous. In my head, cyberpunk brings up the idea of hard edges and straight lines and those are present in this story. The thing is that they don’t overwhelm the comic book feel this web comic has. This is gong to sound weird, but they characters are drawn with full figures that softens the edges that are present in the world around them and gives the panels a warmer feel to my mind. The backgrounds are vibrant and alive and draw the eye to them without overwhelming whatever action is happening in the foreground. As I mentioned, I love how the story unfolds to reveal both more about the characters and the world they live in. The characters are inviting and the world has so many questions that I want to have answered. The unique thing about Buying Time is that it uses a presentation that will be familiar to those who buy their comics through Comixology. Buying time is an animated webcomic. It opens on the page that you will be viewing and takes you through the panels in a way similar to how guided view works. Instead of sliding around on the page, the panel is slowly revealed placing different pieces of the panel up to control the flow of the story. I find this manner of storytelling is very effective and makes the experience even better. Buying Time updates every Sunday and takes a hiatus about every quarter. I recommend going over and checking out the story. You won’t be disappointed. I love deck building games. They give me the play style of Magic: The Gathering without the enormous cost up front and the penchant to be beat by those with will to spend the money for high powered cards. In this arena, most of the games I have played have been more of a race to a victory point total with very little focus on direct attacks on the other player. In games like Dominion and Paperback you do get attack cards, but they are used to delay other players from getting cards to raise their point totals. They do not have you working to put another player out of the game. Star Realms fills this hole nicely. 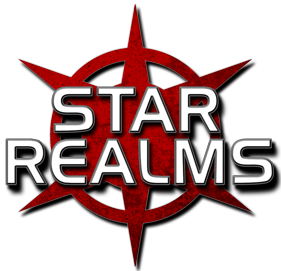 Star Realms is a science fiction based deck building game by White Wizards Games. Players take on the role of a fleet commander. the player’s objective is to decrease the authority, i.e. life points, of the opposing player so that they have control of this given sector of space. The game comes set up for two players with two starter hands composed of eight scouts which provide trade and two vipers which provide combat. There are eighty cars which make up the trade zone and explorers that are always available to purchase.The starting player begins with a hand of three cards and then draws up to five cards. Hand size remains five cards throughout the rest of the game. Game play is simple with each player purchasing cards from the center row to build their deck. They use these new cards to help them drive the other player from the sky. The types of cards available for purchase come in two types, ships and bases. Ships are cards that are played and then discarded while bases come into play and provide two benefits. Bases have a power that is usable each round and provide a line of defense against attack. A base must be destroyed before combat can be used against a player. Bases and ships come from one of four factions within the game world. Each faction describes the style of play. The Trade Federation, oddly enough, values trade. It focuses emphasis on increasing trade and healing damage. The Blobs focus on generating large amounts of combat and removing cards from the purchase area. The Star empire also focuses on combat with the added benefit of drawing cards and forcing discards upon the opponent. The final faction, The Machine Cult, focuses on streamlining the deck through removal of cards and a large number of bases. The mechanical twist that I especially enjoy in Star Realms is the ally ability. This is a power that is on some cards in the game. If you play a card in the same faction, this power triggers and gives the player an added benefit. An example would be ships from the Trade federation. One f the cheapest ships gives the player two trade, but if you play another Trade Federation ship you will also receive two authority. It gives the player the ability to pursue a flexible strategy which I love. The game is available in two forms. You can buy a physical copy of the game from Amazon or your friendly local game store. The game retails for $14.95 which is pretty cheap for a self contained game. You can purchase two decks which would allow for a four player game. You can also pick up the game digitally on iOs or Android. The digital version of the game is only $4.99 which is cheap as chips in my book, especially since I’ve been playing almost no-stop since purchasing the game. The upside of the digital version is that it does have an expansion which is not available yet for the physical version. It is only $3.99 and adds a few more cards into the mix which increases the life-expectancy of the game. The downside of the digital version is that it is clunky if you’ve played any other digital deck building games. For me, I wish I could just tap on a card and it pull up so that I could look at it. Instead, you hold down on the card and it comes up with a slideshow style view. This clunkiness extends to the iOs version in that Star Realms does not connect to the Game Center. If I want to play a game with a friend, I have to know their name on this game and enter it manually. Overall, I love this game. It gives me the head to head style of play that is missing in deck building games. It is cheap and easily accessible with a minimum of ten minutes to start playing the game. I’ve played a significant number of games and I’ve not grown bored with it yet as the variety of play styles it supports keeps games fresh. The availability of the expansion on-line only increases this freshness and I hope White Wizard Games has their physical expansion out soon! If you pick up the game digitally, I am grimgoroth and look forward to you challenging my dominion over the galaxy. 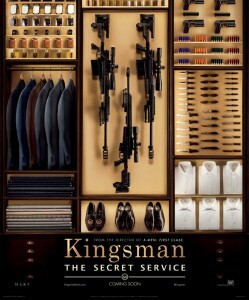 Kingsman: The Secret Service is a spy movie in the vein of old-school James Bond. There are tons of gadgets, ludicrous machinations, and a deadly but quirky sidekick for the villain. It takes this James Bond feel and blends it with a Tarantino-esque aesthetic for violence and a dash of a social conscience that creates a entertaining addition to the spy genre. For star power, Kingsman relies upon Colin Firth to hold up the end of the iconic British super-spy, Michael Cain as the requisite grey eminence that runs the Kingsman operation, Mark Taylor as Merlin, and Samuel L Jackson as the villain of the piece. The other major players in the film are rounded out by Sofia Boutella, Taron Egerton, and Samantha Womack. The performances given by these individuals are all solid. Colin Firth fills the role of the suave and debonair British spy with aplomb and does surprisingly well in the tent pole action sequence that shows the deadly skills that a seasoned Kingsman would possess. Samuel L Jackson also turns in an excellent performance as the violence-averse mastermind with a silver tongue. In particular, I enjoyed that the writers allowed his character be able to pull off most his plan through conversation and collection than murder and mayhem. Kingsman has a sense of fun that was sorely lacking in the first era Bond movies at the end. The predictable plots and crazy villains all felt overdone and paper-thin. Kingsman takes these self-same tropes and puts the rated R lens onto them which is very freeing. When the audience gets to see an agent tear through the villains with the violent styling of Kill Bill, it elevates the absurdly tacky to awe-inspiring gore. It also allows for the violence to be come expected which creates this unique feel for the villain that does not use violence in the regular every-day activities but uses it exclusively for the end-game scenario. and is the end-game ever violent? I won’t spoil that for you. Going into Kingsman, I had some concerns. It is based on the Mark Millar comic entitled, The Secret Service. the book had Millar’s signature over-the top violence and had the typical spy-genre misogyny and racist overtones. The trailers made me feel that this problematic material had been left out but there was no way I could be sure. As the movie unfolds, the audience is given the character of Galahad who is struggling to elevate his institution out of it’s staid and problematic roots. I love when Galahad tells Arthur that he is a snob and that Kingsman needs to adapt with the times or it will become week and ineffectual. The writers and directors take pains to make this spy movie a bit more diverse. They give us a a female Galahad, a person of color as the villain that isn’t a mindless thug, and the mastermind’s assassin is differently-abled without being a caricature. They could have done better but I will take any improvements to one of my favorite genres and hope that the studios see the success of Kingsman and try to push future movies even more. Kingsman turns out to be a gem of a movie hidden in the slush that is the normal fare of movies released in February. If you have a chance, I would recommend seeing Kingsman on the big screen. You won’t regret it.